Maria Montessori was born in Italy in 1870, and against all tradition, attended a boys’ technical school at the age of 13. Maria wanted to fulfill her dream of becoming an engineer. After seven years, she switched her focus to medical studies, and subsequently became Italy’s first female doctor in 1896. In her work at the University of Rome’s psychiatric clinic, Dr. Montessori developed an interest in the treatment of young children, and for several years she wrote and spoke on their behalf. At the age of 28, she became the Director of a school for mentally disabled children. She spent long hours at the school developing her own approach to learning, and after two years, these children–who had formerly been considered unteachable–took a school examination along with normally-functioning students and passed successfully. 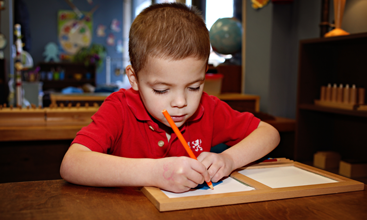 If mentally disabled children could be brought to achieve at the same level as normally-functioning children, Montessori wondered about the untapped potential of children who met standard achievement levels. Dr. Montessori returned to the university to study philosophy and psychology, and in 1907 was presented the opportunity to apply her educational theories to normally-functioning children. She was given the responsibility of establishing a school—a day-care center—for the 50 children living in an impoverished tenement building in the San Lorenzo district of Rome. The property’s owner was tired of the children’s vandalism and offered Dr. Montessori her first chance to set up her concept of what a child-centered environment should be. From these early beginnings developed a method of education that has spread around the world. Initially invited to the USA by Alexander Graham Bell, she appeared in 1915 at Carnegie Hall, and then established a Montessori classroom environment at the Panama-Pacific International Exposition in San Francisco. This was a classroom built with a glass wall around it, and children who had never been to school before came to work in the environment for four months. 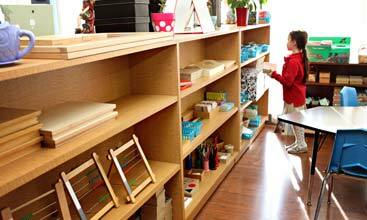 Awarded two gold medals, the exhibit’s success truly established Montessori’s method as revolutionary. 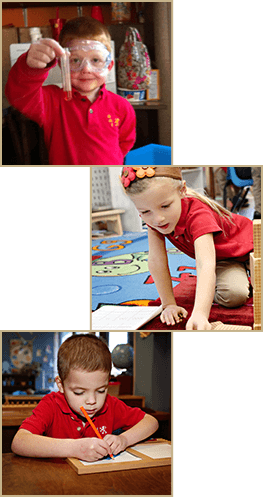 In 1929, Dr. Montessori founded AMI (Association Montessori International) to establish and coordinate training centers to authentically prepare Montessori teachers. Dr. Montessori, whose legacy includes being nominated three times for the Nobel Peace Prize, died in Holland in 1952. 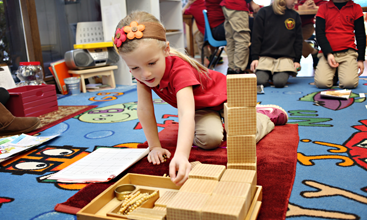 Today, more than 4,000 schools worldwide consider themselves Montessori schools, with 400 recognized AMI Montessori schools in the United States.